Each day during the last week, I've been blessed with hundreds of Cedar Waxwings in my big backyard tree. There is a dense grove of pine trees in the adjoining backyard, with a couple of cedar trees loaded with cedar berries. A dozen Waxwings at a time will fly down into the cedar tree, eat some berries then zip back up to a perch in my tree, almost like they have meal shifts. I've been searching through the large flock carefully hoping I might find a Bohemian Waxwing. So far, no luck, but I am always happy to "settle" for Cedar Waxwings which are among the most sleek and beautiful of all birds. I am reminded of the time when I took my family to Fort Boise WMA to see the Snow Geese. There were two large trees overhanging the dirt road ahead of us chock-full of Cedar Waxwings. I pulled up underneath the tree and opened my sunroof for a better view. Big mistake! Suddenly it started to rain, but it wasn't water. Some of the grossest bird droppings I had ever seen fell into our hair and all over, inside and out, of the family minivan. My wife was not well pleased. So the droppings aren't as picturesque as the birds themselves? 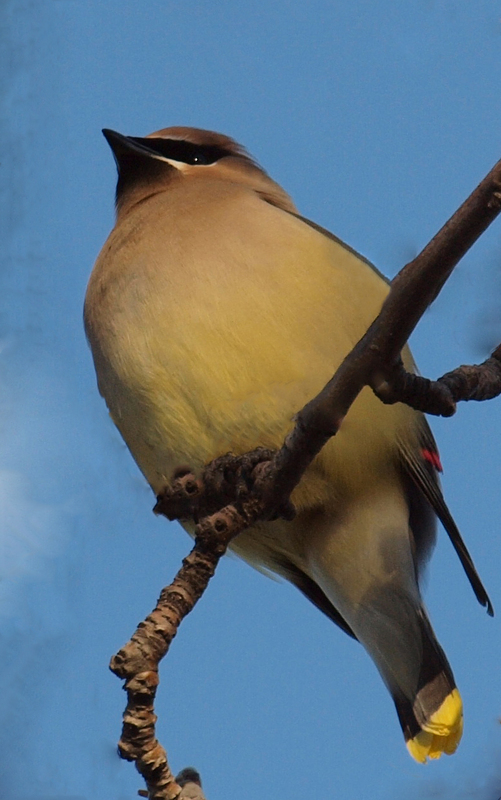 ...I'll "settle" for Cedar Waxwings any day too! I'd love to see 100s in my backyard. p.s. I had to laugh at your sunroof encounter...I can only imagine what your wife and kids had to say! @Mike B. - the droppings were pretty goopey, looking more like worm innards than the remains of seeds. But they did have multiple colors like the fruits they were eating. @Kelly - My wife loves her minivan. She was more ticked-off about the pooh on her van than in her hair. I have to remember that, next time I drive under some Waxwings! Get the wife some flowers, work every time! 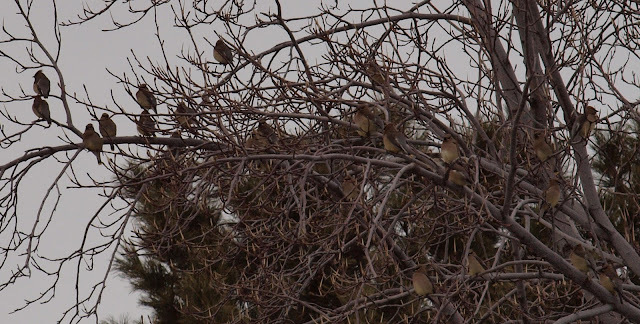 @Ricky - I had the same huge flock of Cedar Waxwings in the front trees this morning. I watched their pooh rain down again, but was learned enough this time to avoid the shower! @dAwN - When you guys bring Homey to Utah, stop on by! Robert, what a FUNNY STORY!